Today we’re looking at antique mirror backsplashes in the kitchen. The top demand of a smart kitchen is good lighting, and mirrors easily help illuminate the dark, under-cabinet areas that are where the food prep happen. But many people have reservations that regular mirror will be too “bright” or will make the kitchen appear more cluttered. Antique mirror is the gentle, overall subtle pattern that allows a vintage feel without being distracting. We are so glad to see antique mirror being used more and more in residential spaces for an intimate feel that still brightens the space and opens it up visually. It’s a smart use of mirror that can instantly make a home more cozy. 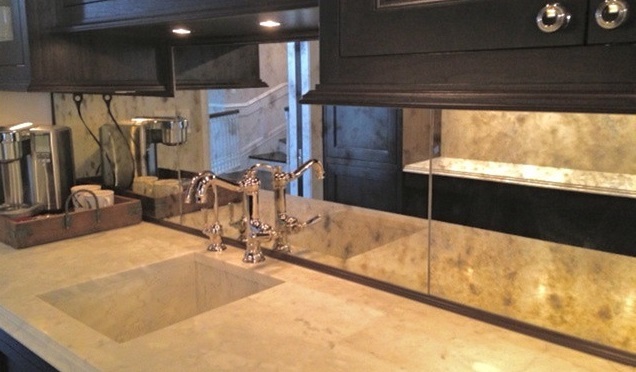 For more information on Antique Mirror New York, or any of our decorative glass products give us a call at 1-929-335-4468.